Lately I’ve been seeing ads targeted at my being listed as both Jewish and single, and all of them link to a Frumster site. Seems Frumster has all these affiliate sites which are Frumster but under a different name. 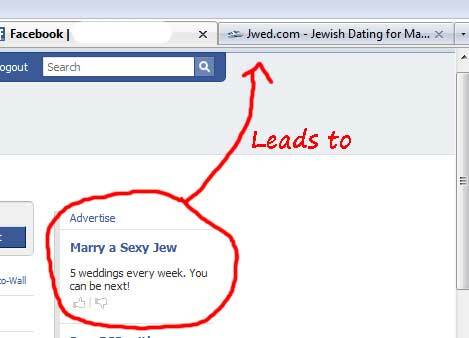 Most are run of the mill: “Marry Jewish: 1200 already married at Jwed.com – You can be next!”. I think there are others, but Jwed.com seems to be the most common. It is Frumster, just under a different name. Today I saw the best one ever. “Hot Jewish Girls!”. And yes, it links straight to Frumster.